Here’s the problem with growing up in a world that tells you you’re entitled to everything (even owning and colonizing people at various points in history): If you don’t know (or learn) better, you’re inevitably bound to touch something—or someone—that doesn’t belong to you. The black customer handles the situation with admirable grace and tact, gently affirming her boundaries while turning an awkward moment into a teachable one. But to our non-black readers, for the thousandth time: Please do not attempt to touch our hair without permission—especially not with the expectation that it will be greeted with such patience and politeness. We hate to explain this basic premise to any adult as if they were a small child, but you can admire something (or someone) without feeling entitled to touch it—especially without first asking permission. That’s right. Look, don’t touch. Furthermore, please understand that when you do violate someone’s physical space in such an intimate matter—even with the best of intentions—they are in no way, shape or form obligated to respond politely. This white woman just got lucky. 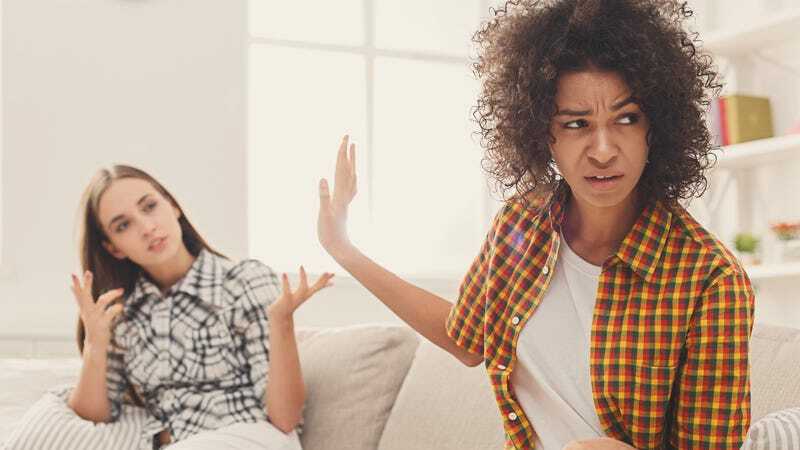 While we used the term “catching hands” in jest, understand that touching someone without their permission can feel like an assault—and should you try it with the wrong person, they may respond accordingly. In fact, one of the most cringe-worthy parts of watching this exchange is how conciliatory the victim is, assuring the perpetrator that “it’s okay” and smiling her way through an interaction in which she is the one who has been violated. We can only imagine how that would’ve played out, had she not—or had the situation been reversed.